Thursday morning, I got up a little after 5, shook off the sleep, ate a bowl of oatmeal, packed my bag, and headed off on my bicycle towards the interisland ferry. On the boat, I fished out my little brown notebook to jot down some questions for the farmer at S & S Homestead where I was headed for a visit. I met Henning at the county fair. He and Peter (farmer here at Synergy) were part of a panel to discuss approaches to sustainable agriculture in the San Juans. They sat on opposite ends of the panel bench: two professor-turned-farmers well into their 70s, Peter, tall, fair, frail and deliberate and Henning, swarthy and compact and full of passion. Peter talked about economic sustainability and soil's organic content; Henning discussed harnessing energies of the universe. 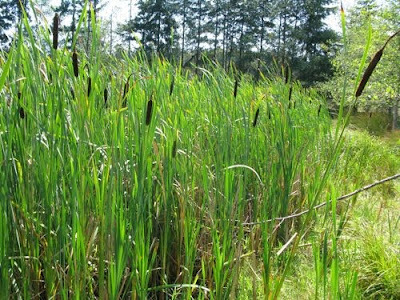 At one point, Henning makes an aggressive jab at Peter, chiding him for importing chicken feed and potting soil instead of producing it on-site. Peter defends his position: after all, his farm has only been in operation for five years compared to Henning's thirty-five. Henning tries to make peace and I step in to introduce myself and ask if I can come out for a visit. He's impressed by my handshake and tells me to give him a call. So that's how I find myself gazing out at the blood orange sunrise Thursday morning on the ferry ride over to Lopez. The ferry bumps up against the plastic bumpers of the Lopez dock and I trudge up the hill, mount my bike, and ride the six lovely miles out to S & S Homestead. I arrive at 7:30, the farm is still. I park my bike in a shed with other bikes for company and wander the small perimeter around what seems like the main farmhouse, looking for signs of life. I wander upon the front porch and see a woman who turns out to be Elizabeth who says she'll get Henning from upstairs. Henning was part of the consulting team that helped Peter and Susan when they were starting up Synergy Farm five years ago. 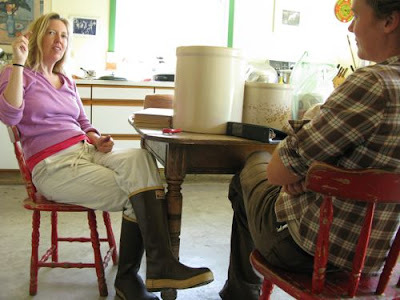 Susan's eyes sparkle when she talks about the elegance of Henning's farm systems: the self-sufficiency, the focus on soil-building, and the incorporation of animals. 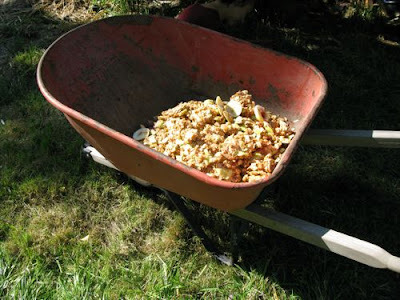 Manure from the animals fertilizes the pasture and makes beautiful compost for the garden. Damaged fruit feeds the pigs and old cabbage leaves are a treat for Lovejoy the milk cow. The farm family: Henning, Elizabeth, Elizabeth's mother, and seven young folks eat from the farm's bounty and return their waste to the soil by way of a composting toilet. Each element of the farm is part of a system and the grand orchestrator of it all are the farmers who have had years of experience and mistakes to hone their craft. 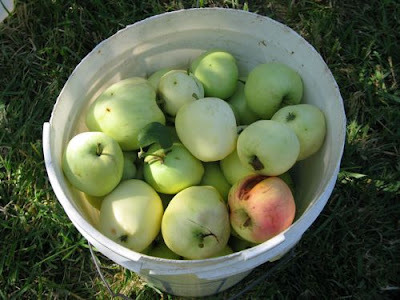 That morning, after breakfast, I go with one intern, Colleen, for the morning milking, then head out with everyone to pick the season's first crop of cider apples for pressing. 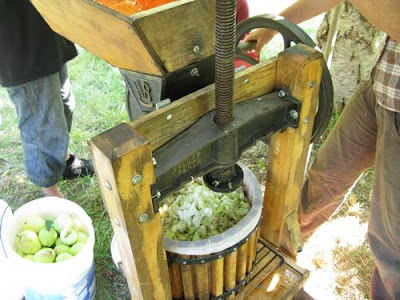 It's an inefficient process, but incredibly enjoyable: five of us pick apples into 5 gallon buckets and munch on Yellow Transparents under the orchard canopy while Henning and his towheaded grand-nephew from Stuttgart set up the press. 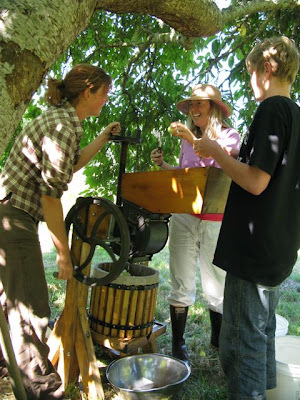 We cut the apples into chunks and feed them into the trough while someone turns the black wheel to grind the chunks into pulp which falls into the net-lined barrel below. 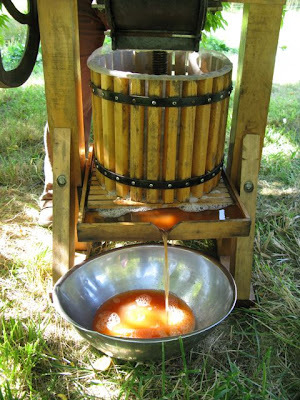 Once the barrel's full, we shift the barrel back on the platform to position it under the screwpress, we place a wooden lid on the top of the pulp, and use a stick to turn the wheel to push the press down and down till the golden liquid pours out the bottom and into our metal bowls. When we're finished, we're left with a bunch of seeds and skin and pulp to feed to the pigs. 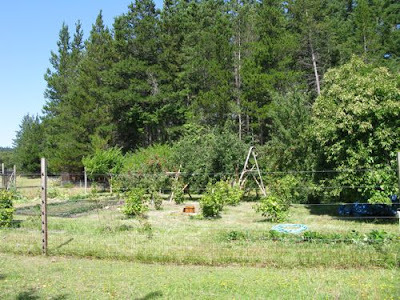 The farm is run by the biodynamic method, developed by Rudolph Steiner in the 1920s in response to falling fertility in the soils in Germany. Despite the fact that he's heralded as a poster-child of the method in the islands, Henning tells me that he didn't know anything about biodynamics until 20 years into his farming adventure when a neighbor came around asking for certain animal parts to make special biodynamic soil preparations. 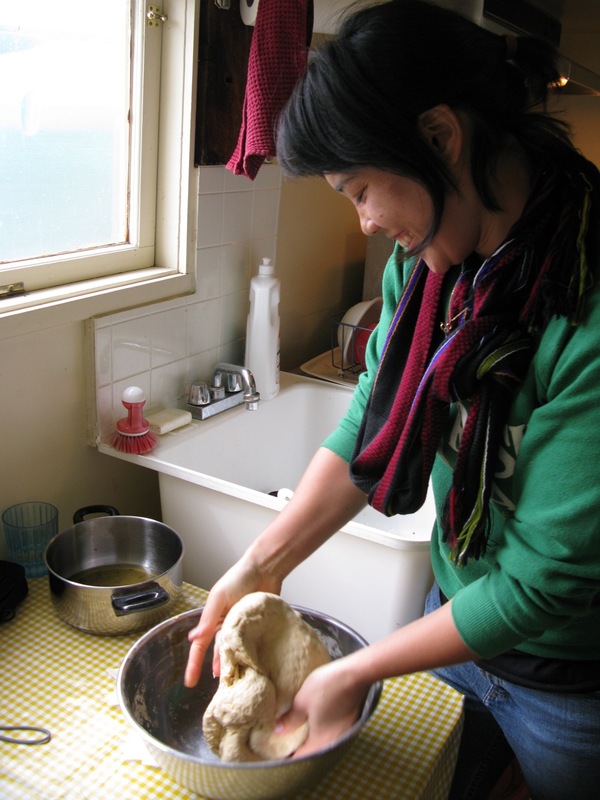 I'm still a novice in terms of my understanding of biodynamics, but three things strike me in particular as different from the biointensive approach we use here on Synergy: one, an appreciation for mystery and an underlying spiritual component; two: the importance of integrating animals into the system; three: the focus on nurturing the farmer and the farm family and the de-emphasis of financial profit. 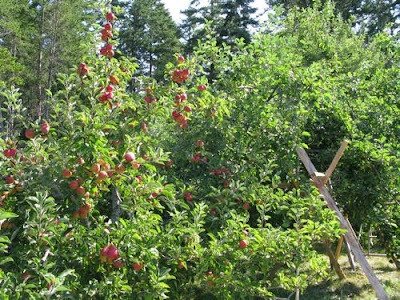 Most every process on the farm seems to be designed to maximize the health and happiness of the farm's main inhabitants. Once we're finished washing down the press, we head towards the farm kitchen to rinse off bowls and transfer the cider to jars for storing. 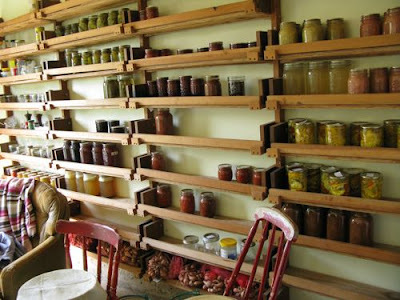 On one wall, shelves of preserved food: chicken broth, pickles, jams, preserves, tomato sauce: a bounty of food to sustain the farm family through the winter season. On the kitchen table, a gorgeous huge crock of sauerkraut slowly fermenting.